This resource supports imagination, play and exploration of movement in young children. 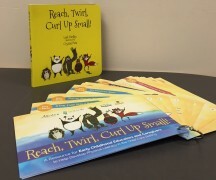 The kit includes a 14 page Reach, Twirl, Curl Up Small board book and 28 activity cards with lesson plans. The kit was developed by the University of Calgary Be Fit of Life Centre and is also available to purchase from the Medicine Hat College Be Fit for Life Centre.